A little Halloween on your feet? Ah, yes. Now that is an idea we can support! We are Halloween experts, after all. It's one of the requisites on our own job applications! So, our costume team knows full well all the ins and outs of the Halloween season. And one of the things that's always in? Jack O' Lanterns. The time-honored tradition of carving your own Jack O' Lanterns is probably a tradition in your home, too, so if you're looking for a way to celebrate the fun on a daily basis, we think you should think about getting your feet involved. By slipping on these Jack O' Lantern Faces Adult Crew Socks! These fun Halloween Crew Socks are ready to dress up your October outfits. 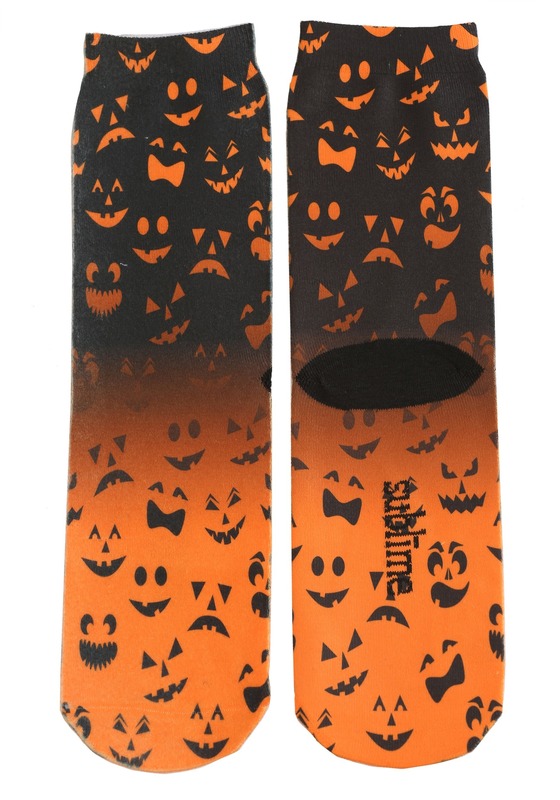 It's never a bad time for Jack O' Lanterns, and these socks feature an all-over design of Jack O' Lantern faces. They're black at the ankle and fade to orange on the feet and are 98% polyester and 2% spandex for just the right fit. If you're as much of a Halloween enthusiast as we are, you could even wear these socks year round. Whenever you're feeling a little spooky or want to show off that you're ready for the Halloween season, just slip these pumpkin-themed socks on your feet!